I’m a big fan of Greek cuisine so it was beyond me why, after all these years living in Encinitas I’ve never been to this place. First off, I never really knew what the name was as “Greek American Family Restaurant” seems like a sub headline, like there should be a name in front of it. That’s not the case and well, don’t let that deter you as it’s the real deal. I should also mention that among the few friends I have in the area, this is the place to go for authentic Greek food. My three trips were limited to lunch, but I’m really excited to go back for dinner and really overindulge as I feel like I’ve rediscovered Greek cuisine and want to go big with it. So let’s start with some of the standbys and I’ll go with one of the more popular items, the Dolmadakia. For those of you unfamiliar it’s stuffed grape leaves with their signature mix of ground beef, onions, rice and herbs served with your choice of Greek yogurt or avgolemono sauce. I went with the unfamiliar to me avgolemono sauce and oh boy was I happy I did that. Avgolemono is a lusciously silky, brightly citrusy Greek sauce made with egg and lemon juice that can be drizzled liberally over anything from vegetables and poultry to fish. In this case it was perfect over the Dolmadakia, just make sure you have some extra pita bread around to mop up any extra. If I could have gotten away with it, I most definitely would have licked the heck out of that plate. Next time I will stand up, identify myself, make a bold proclamation and give it a good lick. Or not. One cautionary note on this dish though. On my second visit on a Saturday afternoon they were out of it, which led to a near hissy fit on my part. If you are planning on including this in your meal, maybe call ahead. They were also out of the Yemista Fournou, the stuffed tomato or green bell pepper with a similar filling as the Dolmadakia. I will be calling ahead next time to avoid a potential meltdown. On a side note, avgolemono looks reasonably easy to make and perfect over fresh asparagus. I will be giving that a shot at home for sure. Next up was the famous and flamboyant Saganaki that has grilled Greek cheese served flambé with warm pita bread and a bold proclamation of OPA! Translated, they pour a shot of Everclear on the cheese and ignite it tableside. The presentation is a blast and it’s even better to devour. A bit of research revealed that the traditional Greek method of preparing this dish has the cheese melted in a small frying pan in the kitchen until it is bubbling then served with lemon juice and pepper and bread. The flambéing at the table with the shout of OPA! then extinguished with lemon juice or “flaming saganaki” apparently originated in the late 1960s at the Parthenon restaurant in Chicago’s Greektown. Whatever the story, who can resist flaming melted cheese with fresh pita bread? Not me, that’s for sure. And I am stating the obvious here, but if there was ever a dish that will captivate kids and that they will love to eat, this is it. Hummus is another obvious choice to get things started and that killer combination of garbanzo beans, garlic, lemon juice and tahini with warm pita bread is amazing. This stuff is healthy right? Healthier than most dips I’m assuming … yeah, I’ll go with that because I can’t stop eating the stuff. There are a dozen or so starters and I would be happy with any one of them and will be back to give all of them a try. I do want to touch on a couple of the standout entrees though and the Pastitsio, or Grecian lasagna, is one of my favorites. 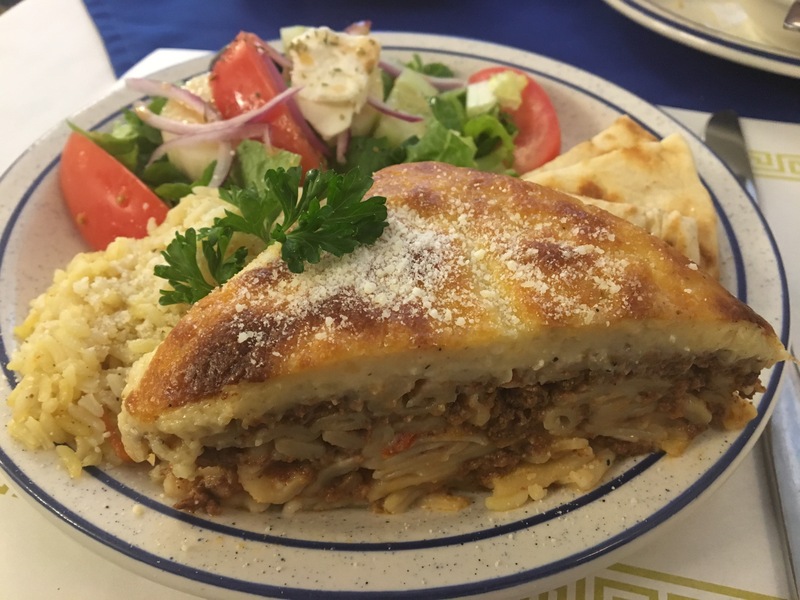 It’s seasoned ground beef layered with Greek macaroni, topped with a crème béchamel then baked to a golden brown and served with rice pilaf. The béchamel takes on a semi-firm consistency with just a bit of jiggle and the perfect topping of this marvelous combination of textures and flavors. While homemade Italian-style lasagna is easy to make at home, this is one that I would leave to the pros. Next time I’m getting it for dinner as I it did not make for a very light lunch with everything else we ordered. Souvlaki or Shish Ke Bab is another standby with your choice of lamb or chicken. Lamb is the obvious choice for me here and served with the satziki sauce is very fabulous. Satziki is that perfect blend of Greek yogurt, cucumber, garlic, olive oil, dill and lemon juice. The dinner menu is a bit more extensive and includes salads, vegetarian dinner entrees and soup. Six dessert options are available including the popular Baklava, Kadaifi and Yogurt and Honey. Beer and wine is available as well. I love when I discover a local place that has been around a while but is new to me and is so good I will put it on that growing list of restaurants to revisit on a regular basis. Greek American Family Restaurant is on that list now, and carry-out is available. Check them out at 392 N. El Camino Real, Encinitas, call (760) 753-8425 or visit www.greekamericanrestaurant.com.